When trying to decide where to settle down for the month, we gave Salinas a try after reading about it repeatedly in International Living Magazine. They frequently talk it up as having inexpensive real estate and living expenses. 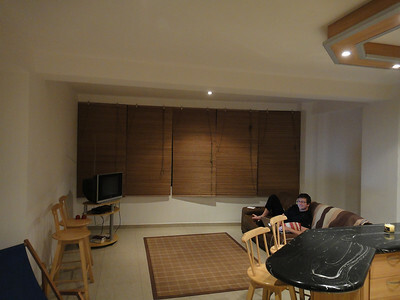 We decided to look into it since we were on a budget and looking for modern amenities. After traveling through 2 countries/5 different cities in just over one week, we were tired of shlepping our bags around. We didn’t bother to shop around. We jumped right into the first place we saw…this newer condo just one block from the beach. 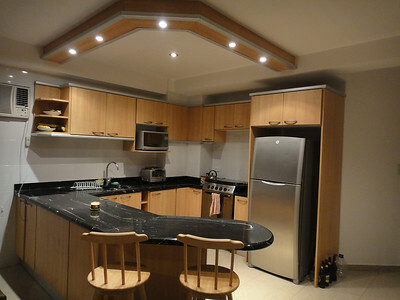 To be able to have this great kitchen and a place to get comfortable has been awesome. Dusty has been able to log many hours doing his geek thang and I’ve had plenty of space to whip him up some tasty treats. But hold on just a minute, I haven’t told you the most awesome part…the bathroom! More specifically, the shower. Our next house will most certainly contain one of these multi head shower panels. I’m the cleanest I’ve ever been! Not only is the condo nice, clean and American style…it’s safe. We enter via fingerprint identification! Not only that, there is a doorman, a slew of security cameras and elevator key card access. The last measure has been a bit cumbersome, actually. One time our key card didn’t work and another time we forgot it. At night, it’s the only way to get to access your floor, so, two nights now we have had to sleep on the lobby chairs until someone could come to rescue us. Once at 6 a.m and another time at 3 a.m. We do not have fond memories of those nights. 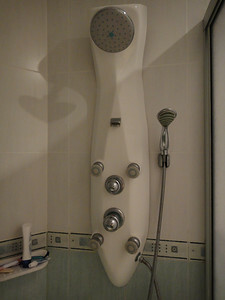 So, what does a two year old, furnished, two bedroom, one bath condo (with awesome shower panel!) just one block from the beach set us back for one month? Just $500! That includes water, electric and wifi! You can’t even get that in Cincinnati. Not even in the crappiest of neighborhoods. This condo also happens to be for sale, according to the owner’s website, for just $75,000. Oh, and did I mention it’s just one block from the beach?!? !